Each month, Shelli Gardner, Co-founder and CEO of Stampin' Up!, hosts a creative challenge on her blog. This month the challenge is to create a card that is simple yet stunning. I couldn't resist playing along this month. I wanted to keep it simple, so I stamped the background with the upcoming Sale-A-Bration set, Fresh Vintage. (BTW...it is my very favorite!) In just a few weeks you will be able to earn this beautiful set for free with the purchase of $50 or more. I stamped the image with Island Indigo ink on Whisper White CS and trimmed it out with Island Indigo CS. I also sponged the edges with the same ink. But be extra careful because the ink is very dark. I had to sponge off onto a piece of scrap paper before sponging the edges. I used the banner from the new set, Take it to Heart, and the sentiment if from another wonderful new set, Apothecary Art. This is what the card looked like at first. Don't get me wrong, I actually like the card just like this...it is mailable and actually very pretty, but not exactly what I would call "Stunning". It needed something more to take it over-the-top. That is when I got the idea to add a pop of color...Poppy Parade to be exact. I used the new Blossom punch from the Occassions Mini Catalog and punched three flowers from the Pocketful of Posies DSP collection. I also punched a smaller layer with the 1-3/4" Scallop Circle and snipped between each scallop with scissors and added a top layer punched with the Boho Blossoms punch. I sponged Poppy Parade ink on the edges, curled the petals, and seperated each layer with Dimensionals. I added a few pearls for the flower center and VOILA! Don't Fall Out of Your Chair! Yes, it's true! I finally stamped a card. I hope that means my stamping mojo has returned. You may not realize it, but it is somewhat difficult to switch between traditional stamping and digital stamping...at least it is for me. To work through my slump, I thought I would try my hand at Karen Giron's Sweet Sunday Sketch Challenge. It's been so long since I've done one of these. Typically, I avoid any layouts which require circles or ovals, but I threw caution to the wind and decided to break out my Spellbinders Nestabilities (non-SU) and give this challenge a try. Karen's sketches are my absolute favorite of all the sketch challenges I have tried. Clean & Simple sketches are a close second. I began with a standard size (5.5" x 4.25") base of Not Quite Navy card stock and layered on some Pear Pizzazz In-Color DSP (Hostess Level 1). I added a strip of DSP from Elegant Soiree and topped it off with some Pear Pizzazz 1/2" Stitched-Poly Ribbon. For the focal point of the card I pulled out the set, Herb Expressions (#113224) and stamped it in Basic Black ink on Whisper White CS. I am ashamed to admit that I got this set a while back, but I just haven't given it the love it deserves. This is the first time it has actually seen ink. It was super easy to color with Stampin' Up! markers. I used Pear Pizzazz and Old Olive for the leaves and Bashful Blue and Baja Breeze for the flowers. The card still looked a little bare, so I added a punched birdie and some brads to give the card a more complete look. Here's my rule of thumb: if it looks like something is missing, then it probably is. You go through a similar process practically every morning when you dress for the day. You look in the mirror and think, "hmmmm, this outfit needs something". It's exactly the same thing with your cards. Often times I see a card that gets off to a really great start, but it looks like they forgot to finish it. In this case the bird and brads were exactly what this card needed to look "fully dressed". Sometimes it helps to set your card on a table or shelf and just look at it from a distance. You can usually tell right away it something needs to be changed. 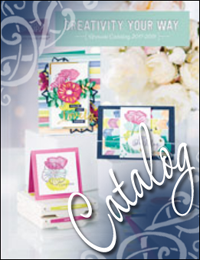 The new "in colors" are finally here...at least for Stampin' Up! demonstrators. You can't purchase them for a few more weeks, but soon you will see several projects that incorporate these hot new colors. Aren't they wonderful? So vibrant and trendy. These are the colors you are seeing all over the stores! I am looking forward to playing with these fun new colors this year. Along with the cardstock and ink pads, Stampin' Up is also giving us markers and polka dotted ribbons!!! There is so much more to tell you about--double-sided papers, new PUNCHES, lots of new exclusive dies for the Big Shot---but I can't tell you specifics until July 1st!